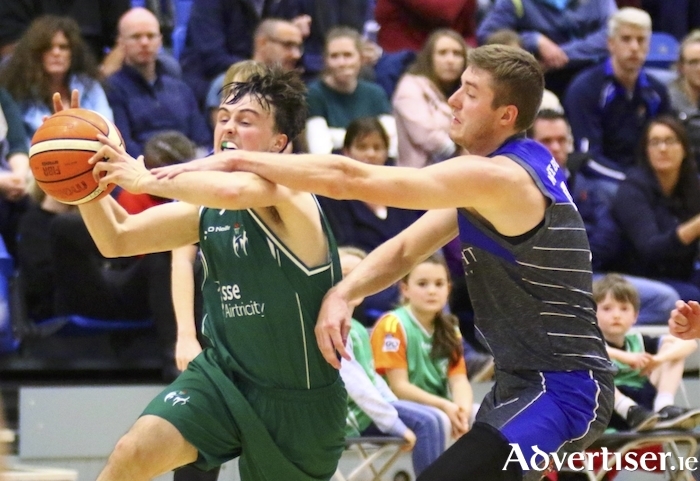 Moycullen took the first spoils in this year's local derby on opening day of the 18/19 Superleague basketball season. John Cunningham's side finished 66-59 winners over local rivals Maree at NUIG's Kingfisher gym to secure an important win ahead of this week's meeting with Superleague debutants Killorglan in Kerry on Saturday. The club's newest acquisition, American player Isaiah Harris-Winn, produced a strong performance, pouring in seven points before Maree had time to get started. And on defence, the home side also looked impressive, with Cian Nihill and Joseph Tummon putting Maree’s big men on lockdown. Eventually the game settled and Maree found their feet, but Nihill and rising star Paul Kelly helped the hosts into a 20-14 lead at the end of the first quarter. It did not get any better for Maree in the second as they only registered seven points in the period, while Harris-Winn continued to be a nightmare for Maree, as Moycullen amassed a 20-point lead by half-time. Maree’s scoring woes continued into the third. Moycullen, though undersized, battled hard on every Maree possession, and their work-rate was reflected on the scoreline, which showed the home team up by 20 or so for most of the period. In the final minute of the third, Maree guard Stephen Commins nabbed a quick five points for Maree, and stole some of Moycullen’s momentum going into the fourth. The final period was Maree’s best and Moyculllen’s worst. The home side’s offence faltered, and Maree capitalised at every opportunity, keeping Moycullen virtually scoreless, and cutting the Moycullen lead to nine with seven minutes to play. A much-needed layup from Kyle Cunningham ended the Moycullen drought, before Maree answered back with a three-pointer. With just under three minutes on the clock, Moycullen led by just three. That was as close as the visitors got. Harris-Winn ran in two crucial fastbreak layups before a Paddy Lyons steal sealed the victory for Moycullen. Moycullen coach John Cunningham said the game was a good learning curve for his youngsters. “I’m really, really happy with our defence tonight. We have a young team, they have to learn it’s a man’s game now. A lot of them have just stepped up from underage and they got a good lesson there on what Super League basketball is all about,” he said. “I’m delighted to get the win, that’s all that matters first game of the season." While Moycullen’s next game sees them travel to Kerry for a match against Superleague debutants Killorglan, Maree will be looking to bounce back from that opening night defeat when they host Templeogue in Calasanctius College in Oranmore on Saturday (7pm ). The game sees the return of former Maree player, Padraig Burke, who was a key figure for the side last season until injury cut his campaign short. Maree defeated the Dublin side in the preseason Donie Greene Memorial tournament two weeks’ ago, but the visitors will go in to Saturday’s game as favourites, having defeated Belfast Star 88-72 at home last weekend. Meanwhile, Maree’s senior women begin their division one campaign with a trip to Dublin on Saturday to take on Swords Thunder (5.30pm ). Joe Shields’ side warmed up for the game when taking part in the IT Carlow pre-season invitational tournament last weekend, when they played Superleague sides Killester, Glanmire, and Waterford Wildcats. Their first home game is Saturday week, when they welcome Ulster University Elks to Oranmore (7pm ). Moycullen: Isaiah Harris-Winn (24 ), Cian Nihill (12 ), Dylan Cunningham (7 ), Joseph Tummon (6 ), Paul Kelly (6 ), Paddy Lyons (5 ), Kyle Cunningham (3 ), James Lyons (3 ), Connor Curran, Dara Kenna.